At the SEMA Show on Tuesday (October 31), Bryan Herta was announced to drive for Andretti Green Racing in the 2007 ALMS, in the team’s Courage LC75 Acura. XM Satellite Radio will be the main sponsor. One of Herta’s duties will be to co-host of "The Andretti Green Racing Hour" along with the 2007 Andretti Green Racing team lineup. The show will be among the high-profile motorsports programmes available on the XM Sports Nation channel (XM 143). "I'm really looking forward to continuing my relationship with XM Satellite Radio and also to the opportunity to spearhead Andretti Green Racing's entrance into the American Le Mans Series," said Herta yesterday. He raced for Panoz Motorsports in the ALMS 2002, having already raced in the Nasamax at Sebring that year. 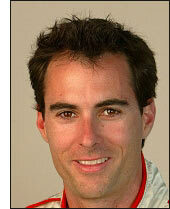 "I look back on my 13 years as an IndyCar driver and have a lot of great memories. Now, it's on to the next chapter of my career, and I'm very excited to drive a world-class Acura Courage sponsored by XM."